Life hasn't always been perfect for Abe and Cassandra Green, but an afternoon on the San Francisco Bay might be as good as it gets. Abe is a rheumatologist, piloting his coveted new boat. Cassandra is a sculptor, finally gaining modest attention for her art. Their beautiful daughter, Elizabeth, is heading to Harvard in the fall. Somehow, they've made things work. But then, out of nowhere, they plunge into a terrible fight. Cassandra has been unfaithful. In a fit of fury, Abe throws himself off the boat. 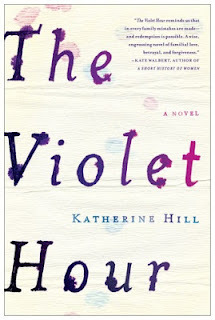 A love story that begins with the end of a marriage, The Violet Hour follows a modern family through past and present, from the funeral home in the Washington suburbs where Cassandra and her siblings grow up to the San Francisco public health clinic where Abe and Cassandra first meet. As the Greens navigate the passage of time—the expectations of youth, the concessions of middle age, the headiness of desire, the bitterness of loss—they must come to terms with the fragility of their intimacy, the strange legacies they inherit from their parents, and the kind of people they want to be. Exquisitely written, The Violet Hour is the deeply moving story of a family suddenly ripped apart, but then just possibly reborn. The Violet Hour had a promising beginning. The first chapter was lovely and contained a great set-up. After that things went a little haywire for this reader. I did enjoy the characters and some aspects of this story. Sadly, there were just too many things happening at once. Funeral homes, sculpture, medicine, sailing, siblings, and adultery were all covered in this book. On their own, those are great topics worthy of a story. But, they were all smashed together resulting in a murky narrative that seemed directionless. Even Hurricane Katrina made a number of appearances in this story, for no reason that I could see. The book is set in Maryland and no one in the book is affected by the hurricane. It didn't make sense for it to be brought up numerous times. Perhaps the author was trying for a melting pot of hot button topics? It didn't work for me. Too bad this one didn't work for you, Jennifer, but it does sound like there was a bit too much crammed into the story to make it work. Man, it can be really frustrating when books seem to go off on tangents for seemingly no reason. I might have to set this one aside for a bit. Just when I thought I'd settled in the rhythm of this it switch direction on me. Rats! Oh dear....I'll give this one a miss. The summary sounds really interesting, but by the time you'd mentioned the Hurricane... if you're going to include it in a book a reader is going to expect some sort of real reason. Especially when hurricanes are awful, to use it but not really discuss it... Yeah, not for me either. It sounded so great, right? Bummer. Pity when a book falls apart! But I do appreciate your honesty in your review. That stinks! I always feel bad when a book has too many good topics squished together because it takes away from what could otherwise be a fantastic read. Thanks for the review...you just freed up a space on my holds list for me! I can't improve on Melinda's comment. But I'm sorry the book disappointed you. It sounds as though the author has promise, but tried to do to much at once. I think you've written a good negative review, if that makes any sense. You're very clear about what didn't work for you and why. Yes, you've probably warned some people off the book. That may be better for the author in the long run. Those readers will be more receptive to another, hopefully better, book by this author in the future, because they won't have linked the author's name with a bad reading experience. I would definitely say that the author has promise. Absolutely. And I'd try something by her in the future. It seemed like a case of too many good ideas thrown into one book for me. You win some, you lose some. Or should I say, you like some, you dislike some? I had to click over because of the cover and the title of the book .. but, yeah ... I can see how such a mishmash wouldn't work!